This album proved to be nothing short of a revelation. The story of Toyz was nearly over before it started; having formed as an instrumental outfit in 1997 and garnered some local success in the Netherlands, their undoing came when they tried to find a vocalist. After several abortive attempts and ‘musical differences’ they called it a day in 2002. However, the band members remained friends and their passion to create music wasn’t diminished so they reformed, albeit with a new keyboard player (Arjan van Gog) this time deciding to stay purely instrumental. Now, I am the first to say that other than some notable exceptions (i.e. Rick Wakeman) instrumental albums quickly lose their appeal because the tunes simply aren’t strong enough to maintain interest, everything sounds the same and/or the key player (usually some fret-mangling guitar manic who thinks it’s clever to cram in as many notes as possible) is too intent on showing off their alleged talent. 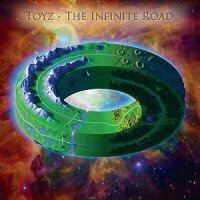 Fortunately, Toyz have the wonderful knack of writing and performing tracks where the guitar, mainly, or keyboards take on the very strong melody lines which act as what would otherwise be the vocal refrain. Consequently one hears something tuneful and melodic rather than an outlet for some instrumental megalomaniac. Guitarist Peter van Heijningen knows the difference between playing with feel rather than flash, he may play fast on occasions but he certainly doesn’t overdo it or allow these sections to overstay their welcome; at times you can even hum along quite easily. If I have a criticism it would be that the drums of Robert van Kooij sound a bit thin and seem to be separate to the rest of the music at times which is probably a production/mixing issue. The diversity of the music is a pleasing aspect here; they aren’t afraid to ease back such as on the delightful ‘Thermal Winds’ with its Santana inflections. Heijningen’s guitar plays a sublime melody on a song that builds in power and takes on a meaner persona when the guitar starts riffing and the Hammond Organ takes the lead. ‘Rock On Wood’ does just that, Rock; a gritty riff and melodic soloing working the oracle rather nicely. The short comedy interlude will bring a smile to the stoniest of faces. I have no difficulty in suggesting that Joe Bonamassa would be pleased if ‘Dream On’ was one of his songs with its Bluesy delivery as its rather special. Elsewhere, ‘Shifting Gear’ has an Iron Maiden thing going on during its intro but later the guitars remind me of John Petrucci (Dream Theater) although I think they could have found a better keyboard sound for the lead instrument early in the piece. ‘Tears Of Joy’ and ‘Mindscapes’ both highlight Jeroen van Boldrik’s lush bass work, the former having a particularly fine guitar theme that puts me in mind of Andy Latimer (Camel). I wasn’t expecting a great deal from this album, but I am pleased to report that it’s proved to be nothing short of a revelation.